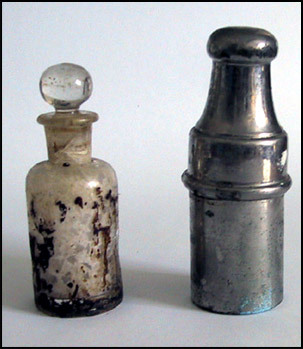 This glass drugs bottle and glass stopper was held inside the chrome plated canister (which has a screw top lid). We can tell by the canister holder that the drugs bottle would have been used in many places as the canister would protect the bottle during transport. It is most likely that this was carried in a General Practitioner's bag. The bottle and canister was made by Maw and Sons about 1920. This piece was donated to the Hospital collection by Mr Alan Green.